As promised, here’s a recipe for Gold Label when it was still brewed in Sheffield by Tennant. Having read a little about this early version, I really wish I’d got to try it. Sounds like it was cracking beer when brewed by the original method. Should you wish to give the recipe – and ageing a go – I’d be happy to drop by and help you drink the result. As Frank Priestley, a former brewer there, remarked, all the ingredients were pale in colour. Pale malt, flaked maize and No. 1 invert sugar. There’s also a little enzymic malt, but you can leave that out. It wouldn’t have impacted the flavour of the beer at all, just helped the mash. At three hours, the boil is extremely long for the period. Porter brewers boiled weaker worts for three or four hours in the early 19th century, but by the end of WW II fuel restrictions had reduced most boil times to around 90 minutes. 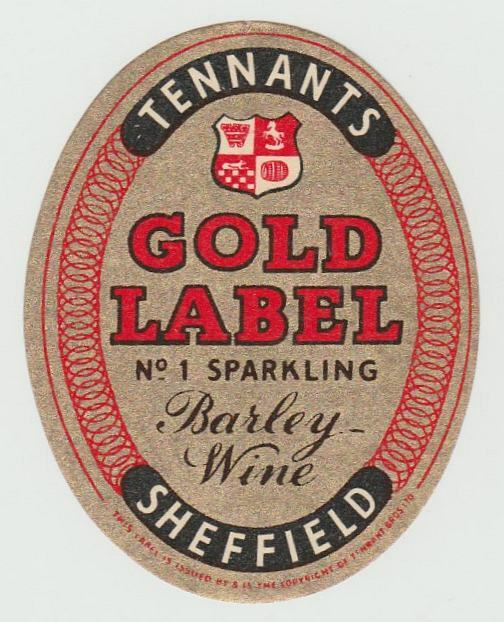 In the 1950’s very few beers were anything like as strong as Gold Label. Out of 1400-odd beers from 1952 to 1959 in my gravity table, only 11 have an OG over 1090º: Bass No. 1, Barclay’s Russian Stout, Benskins Colne Spring Ale, Lacons Audit Ale, Mitchell & Butler Strong Ale, Tennant Gold Label, Tennant No. 1 Barley Wine, Truman No. 1 Burton Barley Wine, Watney Stingo plus two Scotch Ales which were probably for the Belgian market. Tennant were very unusual in having two beers in this class. From Priestley’s book, I know that Gold Label was aged in wooden hogsheads for six to twelve months then blended before bottling. Unfortunately, I don’t know if it was bottle conditioned. My guess would be no, but I could be wrong. Brewing this up sounds like a nice little project for me and a brewer. Who wouldn’t want to sample a beer like this? Are the measures right? When I put this into a calculator I get an OG around 1.080 (maybe I should allow for 3 hours of evaporation and then I get ~4 gallons at 1.100). Are you a little light of the ingredient amounts, or are you indenting the long boil will bring up the gravity? So much corn. So very very much corn. Sorry about that. Missed off a 1 for the pale male. Fixed now. That's a really low pitch temperature for an ale yeast. I'm guessing a very large active starter, lots of oxygen, and letting it rise quickly will be necessary to finish this one out. it's a pretty typical pitching temperature for a beer this strong. The fermentation would have raised the temperature pretty quickly. I may brew this tomorrow. Would Lyle's Golden be acceptable in lieu of Invert 1? yes, golden syrup is a reasonable substitute. Brewed this up today with homemade invert 1. It smelled fantastic during the boil even with all that flaked maize. I achieved 1.110 OG and pitched a slurry of 04 that was collected 5 days ago and pitched at the recommended temp of 56. There is already action in the blow-off. I can't wait till this one is ready! Kegged into my 2.5 gallon corny. Bottled into 12-375 ml bottles, 6-12 oz bottles and 1-22 oz bottle. Sample was fruity, booze, orange-like jammy marmalade, thick malt back bone, bitter and dry. Such a nice sample uncarbed. Warming sensation on this -25F degree day. Bottles will age one year, keg will be drank within a few months. thanks for the report. Sounds like it came out well. The warming sensation sounds bang on. Do let me know how the bottled and kegged versions drink. You could even add Brettanomyces, as in 1954 it was aged in oak for long periods. I should have mentioned that in the post, really, shouldn't I?